SPA is essentially next generation Port Knocking (PK), but solves many of the limitations exhibited by PK while retaining its core benefits. PK limitations include a general difficulty in protecting against replay attacks, asymmetric ciphers and HMAC schemes are not usually possible to reliably support, and it is trivially easy to mount a DoS attack against a PK server just by spoofing an additional packet into a PK sequence as it traverses the network (thereby convincing the PK server that the client doesn't know the proper sequence). All of these shortcomings are solved by SPA. At the same time, SPA hides services behind a default-drop firewall policy, acquires SPA data passively (usually via libpcap or other means), and implements standard cryptographic operations for SPA packet authentication and encryption/decryption. An HMAC applied after encryption protects against cryptanalytic CBC-mode padding oracle attacks such as the Vaudenay attack and related trickery (like the more recent "Lucky 13" attack against SSL). 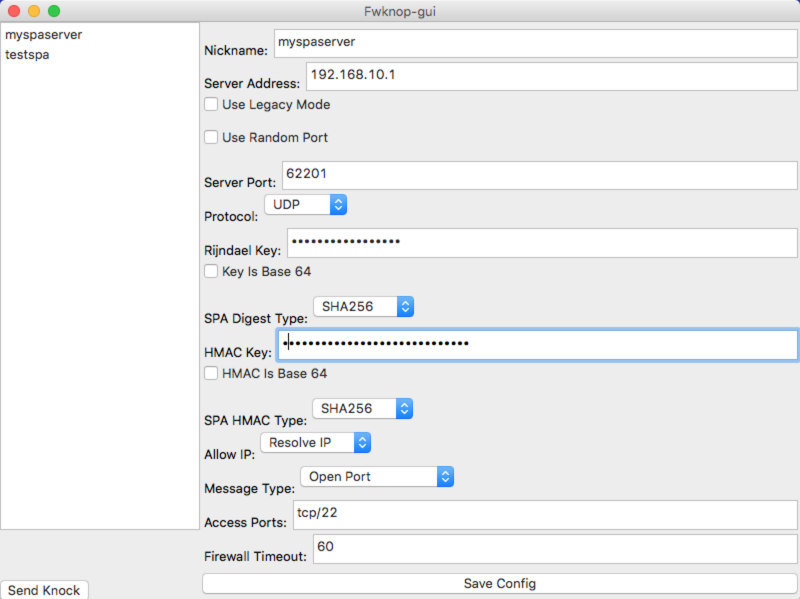 The code required by the fwknopd daemon to verify an HMAC is much more simplistic than the code required to decrypt an SPA packet, so an SPA packet without a proper HMAC isn't even sent through the decryption routines. 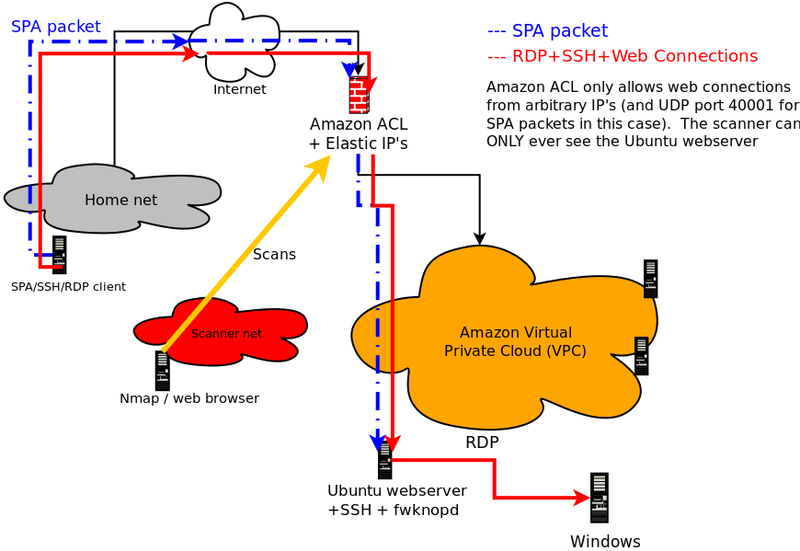 "Basic SPA usage to access SSHD"
"SPA usage on Amazon AWS cloud environments"
The official cross-platform fwknop client user interface fwknop-gui (download, github) is developed by Jonathan Bennett. Most major client-side SPA modes are supported including NAT requests, HMAC and Rijndael keys (GnuPG is not yet supported), fwknoprc stanza saving, and more. Currently fwknop-gui runs on Linux, Mac OS X, and Windows - here is a screenshot from OS X: "fwknop-gui on Mac OS X" Similarly, an updated Android client is available as well. Integration with Tor (as described in this DefCon 14 presentation). Note that because Tor uses TCP for transport, sending SPA packets through the Tor network requires that each SPA packet is sent over an established TCP connection, so technically this breaks the "single" aspect of "Single Packet Authorization". However, Tor provides anonymity benefits that can outweigh this consideration in some deployments.